This comfortable New York style hotel is located in the heart of the city offering modern guest accommodation, a restaurant and beauty salon. The perfect choice for business travellers or those looking to explore all that Ireland has to offer. The hotel has a number of facilities and services including room service, air conditioning, Wi-Fi access and a night porter. Each of the well-appointed and comfortable guest rooms are en-suite and come with complimentary toiletries, tea and coffee making facilities, a phone and work desk. Business travellers can take advantage of the business centre which includes meeting rooms and all guests have access to the fitness centre during their stay. 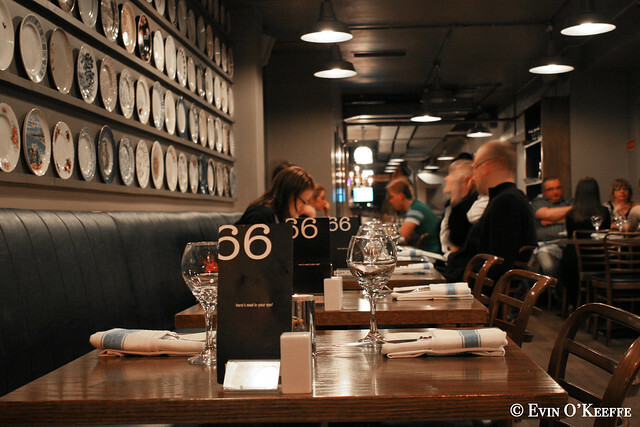 Brasserie Sixty6 is a high quality restaurant and very popular in the area. Every dish is cooked to order using locally sourced and fresh ingredients. The atmosphere is welcoming and the staff are very attentive. A great choice for families and business people. Head to Café en Seine in Dawson Street. This stunning bar is a sophisticated setting where you can enjoy a quiet drink or visit on a Sunday to listen to the smooth sounds of jazz. The bar is open until 3am on Wednesdays and Saturdays. Take the children for a chocolate adventure they will never forget at Butlers Chocolate Experience. This chocolate factory will teach you everything you ever wanted to know about chocolate, you can watch a chocolate movie and see a working chocolate factory. Watch as they decorate the chocolate and then taste it. Finish off your experience at the on-site café where you can have a mug of delicious hot chocolate before heading back to your hotel. Ha’Penny Bridge is an old bridge dating back to the early 1800’s. This bridge runs over the River Liffey and is a pedestrian only bridge. It’s a very romantic setting especially at sunset and the evening as the bridge lights up offering a truly romantic setting. The National Gallery is a must for anyone looking to soak up some culture while in Ireland. This gallery is home to a choice of European and Irish fine art dating back to the renaissance period. The gallery offers free entry into the permanent gallery and is a must for anyone looking to explore what Ireland has to offer. Head to Georges Street Arcade, a landmark building bursting with over fifty shops and stalls. You can find everything here from fashion items to antiques. There are also a number of restaurants and coffee houses to take advantage of during your retail therapy session.